Side One of Season Schedule – Front of brochure with stabling rates. Side Two of Season Schedule – Playing & Social Membership rates, season schedule & contact information. 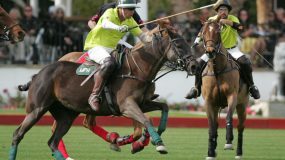 The first polo tournament of the 2010 – 2011 season is the “Open House” Tournament. Game reports, a team line-up and other related information will be posted here when that tournament gets underway. The new partnership brings together 6 grass polo fields. INDIO – Owners of Empire Polo Club, Twin Palms Polo Club and Rancho Polo today announced a new partnership that significantly broadens regional competition and engages player voice as an integral part of its operations. “This decision to harness our strengths and work together underscores how seriously we feel about providing a competitive environment for players. We want to guarantee a bright future for polo locally and regionally and we’ve put together an advisory panel to help us do just that,” said Empire Polo Club owner Alex Haagen III. The advisory panel of players, coaches and consultants will join club owners Haagen, Chris Maloney of Twin Palms Polo Club and Kevin Ittig of Rancho Polo in collaborative decision making concerning the tournament schedule, player development, playing surfaces, membership and venues. Joining the panel are Vicky Owens, Empire Polo Club polo manager; Graham Bray, Twin Palms Polo Club cofounder and manager; Susan Stovall, a membership consultant; and Eric Wright, for player development. Going forward, the advisory panel will work with owners to offer players sanctioned competition at the coaching school, and at beginner, 4-goal and 8-10-goal levels. Discussions are ongoing with pros and patrons to deliver high goal polo at 14-plus goals. Schedules, venues and membership details are currently being developed. Goals of the partnership are to preserve the legacy of the 2,000-year-old sport while embracing demand for accessibility and change. Polo Pro Mike Conant announced he will bring the women’s Debii Dollar Conant Memorial tournament to Empire Polo Club’s schedule. Recognized as Women’s Championship Tournament (WCT) qualifier, Conant founded the competition for his late wife, Debii Dollar, a tough competitor credited with advancing and promoting polo for women. Women were first permitted to compete in the sport in 1972. They play on equal footing and by the same rules as men. WCT Founder and seven-time Woman Player of the Year Sunny Hale said women currently represent the fastest-growing number of players in the sport. “I’m really excited to include the Empire Polo Club and the Debii Dollar Conant Memorial to the WCT. 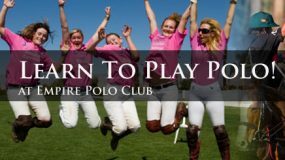 This top level women’s polo tournament draws some of the highest rated women players worldwide to the competition. With this new initiative of the Empire Polo Club and its spectacular venue setting the stage, this tournament has the ability to be one of the most important women’s polo events in the world. I support the efforts of Alex Haagen and his team in making that happen,” Hale said. Registered members of the United States Polo Association barely reach 4,000. With slightly over 300 registered clubs and schools in the country, growth of the sport at all levels is a concern, and particularly at the collegiate levels, according to the association. Twin Palms’ Chris Maloney said that the agreement allows the clubs to provide schedules that meet demand for flexibility, a variety of high quality playing surfaces and closely located facilities. “I’m excited to be playing a role in advancing polo here and encouraging its growth by engaging all the right voices. I look forward to the successes of this unique collaboration,” Maloney said. The Empire Polo Club is the region’s premier event destination featuring seven diverse venues situated on a thriving, sustainable oasis of palms, plant life and five polo fields. The 225-acre property offers the signature Medjhool Lake, Tiki Hut and Sculpture Garden, The Rose Garden and Pavilion, The Forum with its tiered terraced space, the exclusive nightclub The Date Shed, the majestic Hacienda del Toro and The Tack Room Tavern bar and restaurant. For more information about polo opportunities at Empire Polo Club, contact Polo Manager Vicky Owens at (760) 393-7298. INDIO — The new partnership formed between Twin Palms Polo Club, Rancho Polo and Empire Polo Clubs will offer a mix of U.S.P.A.-sanctioned and club tournaments and enlist player voice as a driving force in the club’s administration, according to a letter released by Al Haagen III on Wed. July 7. Haagen said the club will also feature player development options with coaching and low-goal tournaments, a full-size indoor arena and premium stabling with turnouts–for a single, low, all-inclusive price. Players, members, their friends and families will be able to enjoy full-service dining and entertainment at the club’s Tack Room Tavern bar and restaurant and a new Date Shed night club. Its tournament schedule and pricing will be available within weeks, the club said. Summer polo is currently under way. Green horse polo is held Tuesdays through Sundays at 7:30 a.m. Polo under the Lights continues and the Coyote Cup Open tournament is scheduled in August. The Empire Polo Club is the region’s premier polo club and event destination featuring seven diverse venues and five polo fields situated on a thriving, sustainable oasis of palms and plant life. The 225-acre property offers the signature Medjhool Lake, Tiki Hut and Sculpture Garden, The Rose Garden and Pavilion, The Forum with its tiered terraced space and private field, and the majestic Hacienda del Toro. Full service dining and entertainment is featured on site at The Tack Room Tavern bar and restaurant and the valley’s hottest nightclub, The Date Shed. Year-round polo schedules and information available through Polo Manager Vicky Owens at (760) 963-9930. For event information, contact Events Director Summer Parkinson (760) 342-2762.